In this photograph, a man of Chinese origin looks around the exhibit in the interrogation room with his family, several decades after being there as a detainee. The photographer, Jerry Berndt, was a photojournalist known for his work documenting struggles for civil and human rights. In 1999, sixteen years after opening to the public, Angel Island Immigration Station became a National Historic Landmark and received funding from the National Park Service and the National Trust for Historic Preservation to restore the facilities. The Angel Island Immigration Station Foundation works closely with California State Parks to preserve the buildings and provide educational materials, keeping alive the stories of the island and the people who were there. Berndt, Jerry, “Man of Chinese origin with his family. 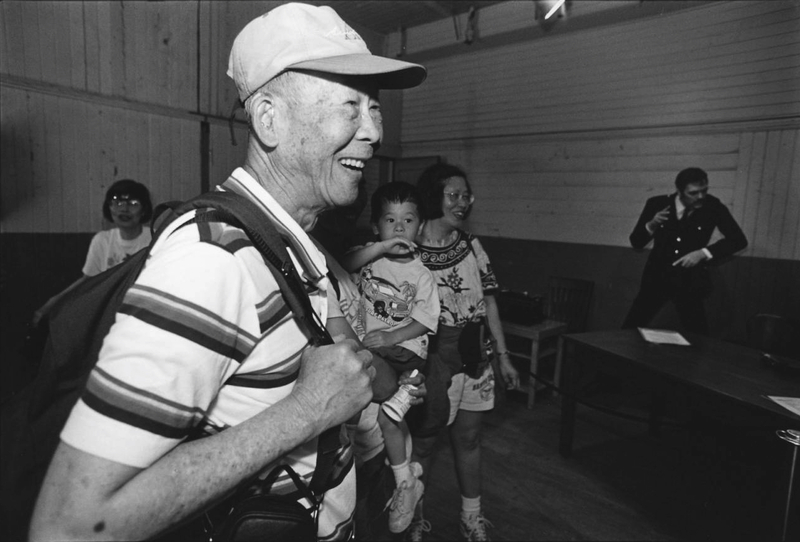 He was detained at Angel Island Internment Camp, Angel Island, San Francisco, California, 2003,” Digital Public Library of America, https://dp.la/item/c3109dde3d2816b347a7e478b2364903.